Update 7/18/17: This story has been updated to clarify that there are no axonometric diagrams for the design that was reviewed at the NCPC's last meeting. The Nation’s Capital came a step closer to gaining a World War I Memorial this month when a key federal panel approved a conceptual design for the project—even though panel members and others expressed concerns about the latest plan and its potential impact on the selected site. Representatives from the nonprofit The Cultural Landscape Foundation (TCLF) and a retired high-ranking landscape architect with the National Park Service joined the federal panelists in questioning aspects of the design, which calls for the memorial to be added to a 1981 park by the noted landscape architect M. Paul Friedberg. Friedberg, via an email message shared with the commission, expressed disappointment with the proposal. After an hour-long discussion, the National Capital Planning Commission (NCPC) voted unanimously on July 13 to accept its executive director’s recommendations for adding a memorial to Pershing Park, on Pennsylvania Avenue near the White House. The vote means the design team and its clients, the World War I Centennial Commission and the National Park Service, can now move to a second, more detailed stage of design work on the project, which is expected to cost $30 million to $32 million. Sponsors of the memorial are aiming to complete it in time for a late 2018 dedication. The design will have to be reviewed at least two more times before any construction can begin. The U.S. Commission of Fine Arts also must give its approval. Congress authorized the World War I Centennial Commission in 2014 to build a memorial at Pershing Park, a 1.75-acre public space bounded by Pennsylvania Avenue, E Street, and 14th and 15th streets N.W. The park is named after General John J. Pershing, general of the U.S. armies in World War I, and contains a memorial to him. To select a designer, the World War I commission held an international competition in 2015. The winner was Joseph Weishaar, a graduate of the University of Arkansas Fay Jones School of Architecture. He called his entry “The Weight of Sacrifice.” Other design team members include New York sculptor Sabin Howard, landscape architect Phoebe Lickwar, and GWWO Architects, the architect of record. The design presented this month (PDF) was a revision of a concept that the planning commission reviewed last November. The revamped design called for retaining more of the existing park than before, and a memorial consisting of three main components. The first is a 65-foot-long bronze bas relief wall on the site’s western edge, featuring images from the war along with a water feature. The park’s pool would be retained, although a path would be added to provide access to the commemorative wall. A flagpole would replace an existing kiosk. 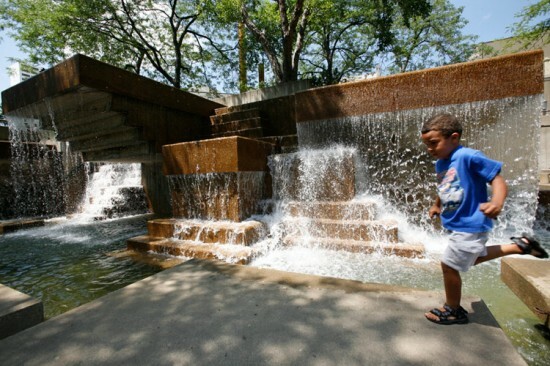 Part of the sensitivity of the project is that Pershing Park is already considered a significant public space, deemed eligible for listing on the National Register of Historic Places. Besides the original design by Friedberg, the park reflects a planting plan by the office of Oehme, van Sweden. For those unfamiliar with park in its prime, the video below from TCLF details its conception and features sweeping views of the then newly-completed project, with commentary from Friedberg: During the latest review, a key issue was the extent to which the project should be treated as an opportunity to preserve Friedberg’s work, as opposed to treating the site as a blank slate for new construction. 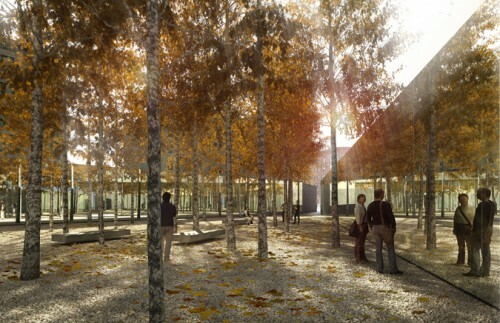 In voting to advance the project beyond the conceptual design stage, the planning commissioners encouraged the memorial’s designers to retain the best features of Friedberg’s design, as much as possible. Commissioner Evan Cash noted that the nature of the project has evolved because of the desire to respect Friedberg’s work. He questioned whether the sponsors shouldn’t just “go back to the drawing board” and launch another competition. “What started as a design to put in a World War I Memorial has turned into a restoration project for the original park,” he said. Commissioner Mina Wright said the design team has a difficult task because it has been charged with adding a major memorial to a key public space while also respecting what’s already there. “This is a really vexing problem, two different … interests that the design team has been asked to resolve,” she said. “It’s serving a lot of masters.” In public testimony about the design, a representative of TCLF, Margo Barajas, stressed the significance of retaining the best elements of Friedberg’s design, especially the waterfall and pool. “Pershing’s waterfall and pool are one inseparable landscape feature located in the heart of the park,” she told the panel. “One need only look at earlier images of the park when the waterfall was well maintained, the pool was full, and cascading water provided animation. The park was a popular destination that was embraced by the public. The waterfall’s gushing sounds, the white noise masking the adjacent traffic, and the cooling mists, all absent from the now-proposed WWI Memorial revised concept design, were keys to its success.” Barajas said the foundation believes the 65-foot-long wall is too long for the location and would be a visual barrier to Pershing Park. “Collectively, the visual and physical barrier created by the insertion of this wall, backed by a pool with sheets of water running down its shorter northern and southern sides, the corresponding loss of more than 50 feet of open physical and visual access between the upper and lower western plaza levels,” the loss of an extensive tree canopy on the western edge of the pool, and the “the loss of the dynamic, animating qualities of water that are fundamental to the park’s feeling, would result in a less successful urban design,” she warned. Barajas noted that the WWI Centennial Commission has presented and then rejected a design proposal called the “Upper Wall Design.” She said TCLF believes it is worth revisiting. “It would retain the existing waterfall and pool and site the 65-foot-long wall along the elevated north-south walk behind the waterfall,” she said. “Depending on the height of the wall and the waterfall, this memorial gesture could be seen from multiple vantage points throughout the park. Barajas quoted a June 25 email from Friedberg to landscape architect Phoebe Lickwar, which was written after the latest design was shown to the fine arts commission on May 18. “To say that I was disappointed in the design presented to the U.S. Commission of Fine Arts (CFA) on May 18th—the 'Restored Pool Concept'—would be a gross understatement,” Friedberg wrote, characterizing the long wall as a “one note” design move. Friedberg said in his email message that he was encouraged that members of the World War I Memorial design team met with him to learn about the original design. He said that gave him a “positive feeling” about the project. “I appreciated that several [Commission of Fine Arts] members suggested we finally meet, and thought that the first meeting with the design team produced a common goal and understanding of how a World War I Memorial could add a layer of content and experience that would enhance both the park and Memorial,” Friedberg wrote. “It was unfortunate that the World War I Centennial Commission’s vice chair, Edwin Fountain, and the Memorial’s sculptor, Sabin Howard, did not attend,” he said. “Their absence from our discussion may account for the design outcome, the persistent and intrusive one note wall that’s being forced into the space thus obliterating the scale and meaning of the original design." “I can only assume that the design team was forced by the insistence of the client (the WWI Centennial Commission) to shoe horn in, at all costs, the wall,” Friedberg continued. “The negative impact on the overall design is too much to pay and unnecessary. The rejection of the numerous previous designs by the U.S. Commission of Fine Arts should have sent a clear message that forcing a solution with a preconceived result was not working and any preconceived notion would be a burden on creativity. It takes a good client to produce a good design.” Another speaker from the general public, landscape architect Darwina Neal, retired Chief of Cultural Resources for the National Capital Region of the National Park Service, said she worked on Pershing Park when it was being planned. She said Pershing Park is a “signature designed landscape” by Friedberg, who is considered “one of modern American landscape architecture’s most accomplished urban designers.” Neal said the World War I commission’s objectives, as stated in its design competition, were to come up with a design that would “enhance the existing Pershing memorial by constructing … appropriate sculptural and other commemorative elements, including landscaping.” “Although this design is billed as the ‘Restored Pool Concept,’ this is a serious misnomer,” she told the panel. “Rehabilitation would have been a more apropos treatment description, but it does not achieve that either because, in reality, it would not only destroy the existing fountain … as the major focal point within the central room of the park, but it also compromises the pool itself by putting walks across it.” Neal said she believes it is commendable that the berms enclosing the park would remain intact, but the proposal to remove the existing fountain, change the size and depth of the pool, and cover about 40 percent of its surface with new walks would have “extreme adverse effects” on the integrity of the existing park design, because the existing fountain is the main feature. 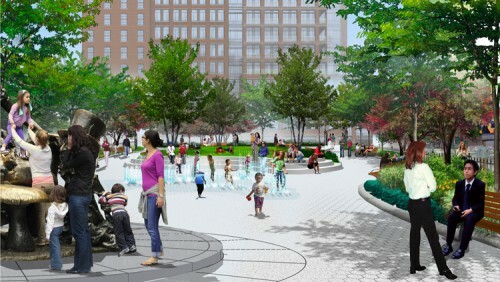 Replacing the fountain with a 65-foot-long sculptural wall would also disrupt visual and access continuity between the pool area and the west end of the park. The proposed pool behind the new memorial wall, which features what appear to be side “sheets” of water, would not even be visible from the pool area, let alone heard—and thus would not be a “splashing fountain.” Neal said she advocates more of a preservation approach and believes rehabilitating the existing park, with minimal changes, could “considerably reduce” construction costs. “Since the basic well-designed framework of the park still remains, there is no excuse for abandoning the original design,” she said. “Rather, it should be rehabilitated. Demolition by neglect should not be tolerated.” Neal also urged reconsideration of the “Upper Wall Design” that would locate the commemorative wall along the upper north-south walk behind the fountain. “This placement would require little change to the existing park features and have no consequences on the experience and function of the park, other than somewhat affecting views from the west that are already limited by existing trees,” she said. “Most important, the focal fountain and pool would be retained in place, with the wall visible above the fountain, as viewed from the pool area.” Instead of a flagpole, she said, “the existing concession kiosk could be replaced by an interpretive/informational kiosk—perhaps an interactive high-tech one with stations on which users could get information on the war and perhaps even be able to input names of relatives who served in the war and information on them, and/or leave messages/comments, etc. Such a kiosk could increase visitor use, education, and enjoyment.” Above all, Neal said, she believes “it is crucial to maintain the fountain, which is the heart of the design.” When it was working properly, she said, it “pumped life into the focal pool and plaza area, creating a vibrant public space” along Pennsylvania Avenue. “I would hope that this vitality could be brought back to life!” she said. Among the recommendations from the planning commission’s executive director were for the design team to: consider reducing the size of the commemorative wall “to improve views across the park,” consider integrating a water feature into the commemorative wall “consistent with the location and orientation of the existing cascading fountain,” provide additional details regarding pool modifications and what the water-related areas will look like during times of year when they are empty of water, and prepare a “park programming” plan that identifies the proposed urban park spaces and potential activities that can take place there. Weishaar and John Gregg, associate principal at GWWO, attended the meeting but were not asked to speak to the panel or address concerns about the design. They said after the meeting that they would take the panel’s comments into consideration as they work to refine their designs. 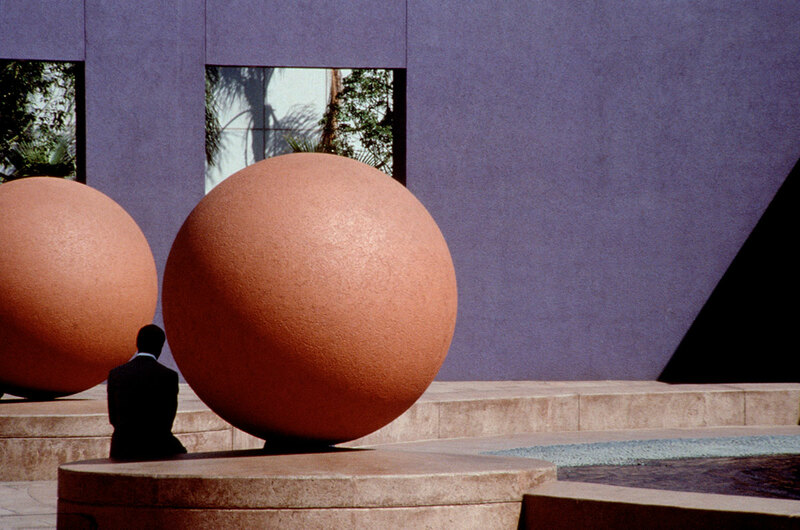 Peavey Plaza, downtown Minneapolis’ celebrated modernist square completed in 1975, fell into disrepair—two of its three iconic fountains are no longer operational, and its sunken “garden rooms” have helped harbor illegal activity. Landscape architect M. Paul Friedberg’s plaza became the focus of a high-profile preservation battle two years ago, with The Cultural Landscape Foundation (TCLF) leading the charge to rehabilitate Peavey and city officials pushing for demolition. Now TCLF has announced the plaza has been listed in the National Register of Historic Places. The “park plaza” style Friedberg forged is evident in Peavey’s blend of hard concrete squares and American-style green spaces. It joins 88,000 sites of architectural heritage on the list, only 2,500 of which have significance in landscape architecture. Preservationists sued the city last year to contest city council’s claim that there were “no reasonable alternatives” to demolition, hoping to win protection under Minnesota’s Environmental Rights Act. On the eve of World AIDS Day, dozens crammed into the City Planning building in downtown Manhattan where the Rudin Organization presented plans for the former St. Vincent’s Hospital site at a Universal Land Use Review Procedure (ULURP) hearing. The commission is set to vote on the plan on January 24, but over the last few months yet another issue has emerged at the long contested site. Activists from the Queer History Alliance continue to press for an AIDS Memorial to be placed at a proposed park across the street from the former hospital, which was considered ground zero during the height of the AIDS crisis. The so-called Triangle Park has played an interesting role throughout the ULURP. Privately owned by the Rudin family, the park, along with the old O’Toole building, holds air-rights integrated into the development plan across the street where the Rudins want to build a multi-use project that includes housing, retail and a school. The park sits atop an underground storage space. The Queer History Alliance would like to turn the park into a memorial and the storage space into a museum. Rudin representatives expressed concerns that ranged from above ground access via elevators and stairs, to a Certificate of Occupancy for an underground museum, and adjustments to the environmental impact study. Earlier this year, Queer History's Christopher Tepper and Paul Kelterborn, both urban planners, began lobbying for the memorial and by September the group announced a partnership with Architizer to sponsor an international competition for new designs, despite the fact that the Rudins had already retained landscape architects M. Paul Friedberg and Partners for the project. On Monday, Architectural Record signed on as a co-sponsor. The deadline for the competition is January 21 with winners announced on February 1—eleven days after City Planning’s vote. Tepper said that the competition would seek to combine passive recreation with memorializing. “We don’t want a park that is designed independently from a memorial,” Tepper said in a telephone interview. “It’s about marrying those two ideas.” He added that the group is looking for a “thoughtful place holder and flexibility so that the design process can work its way through.” By proposing the memorial, the Queer History Alliance threw the latest monkey wrench into the Rudins' five-year odyssey, which saw the collapse of St. Vincent’s, an unrealized Pei Cobb Freed design, the preservation of Albert C. Ledner’s Maritime Union Building (aka-the O’Toole Building), and new design proposals for the Triangle Park, seen by many as a new gateway to Greenwich Village. The jury for the competition includes many arch-world stars, but jumps beyond borders. Michael Arad will chair. He is joined by Record's Suzanne Stephens, landscape architect Ken Smith, novelist Kurt Andersen, MoMA’s Barry Bergdoll, Elizabeth Diller, the High Line’s Robert Hammond, GMHC’s Marjorie Hill, choreographer Bill T. Jones, and Richard Meier. There has been some pushback from residents. While the community board supported the notion of the memorial, it also held reservations about using the below ground space. 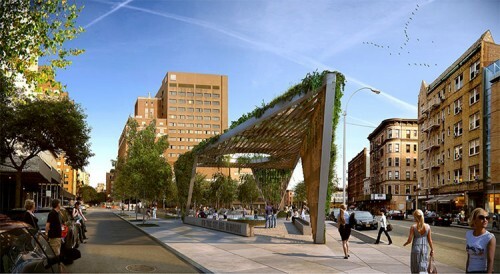 At a meeting in September one resident pointed out that the Village already has an AIDS memorial in Hudson River Park. Nevertheless, the board favored the memorial, as did Borough President Scott Stringer. At the hearing, Rudin executive vice president John Gilbert pointed out that the project encompassed practically every major urban issue, from education, to preservation, to housing, and open space. "All well meaning policies collide here," he said of the site. No matter the outcome of the competition, any commemoration would need support from the Rudins, as they own the property. Earlier M. Paul Freidberg designs did include gestures towards memorializing the AIDS crisis and the Sisters of Mercy who worked at St. Vincent’s through discrete pavement markers. But a discrete plaque is not what the Queer Historians have in mind. “No way is that type of marker commensurate with 100,000 New Yorkers who have died,” said Tepper.